Senior Tyler Evans sank a three-point basket at the end of overtime to secure a 56-53 victory for Findlay against Cal Poly-Pomona in the NCAA Division II basketball championship game, Saturday at Springfield, Mass. It was Evans’s only field goal of the game, and it completed not only a championship but an undefeated season. The Oilers are the fourth team to go unbeaten in Division II since the NCAA tournament for that level began in 1957. The title marked the second NCAA team sports championship won by an AICUO member institution this season. Mount Union’s football team won its Division III title in December. This is the first NCAA basketball championship won by an AICUO member since 2004, when Wilmington’s women’s team took the Division III title, and the first unbeaten season crowned by a championship since the 1994-95 Capital women won all their games, including playoffs, also in Division III. As noted recently, the Mount Vernon Nazarene women won this year’s National Christian College Athletic Association basketball championship. 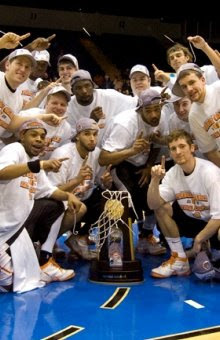 AICUO’s other most recent national basketball title came in 2005, when Walsh’s men’s team won the NAIA Division II championship.